It’s been a productive week! Hubby took the week off and we spent it doing the final teardown of a project that we’ve been working on for 5 years. Our property was a pheasant farm when we purchased it, and it was full of pens made of logs and chicken wire. Unfortunately, the pens were falling apart and needed to be taken down, which has been a perpetual project for the last 5 years. 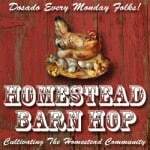 What happened on your homestead this week? Ready to share those links? 4. 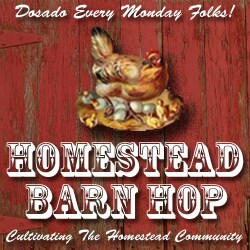 Please link back to the Homestead Barn Hop in the post that you share! Feel free to grab the banner at the top of this post to link back to us with. Thanks so much for hosting, Jill! Thanks for hosting Jill! Hope you have a super week! I love your new look. Very classy. Good morning! Today I shared a couple of posts. One is a recipe for restaurant-style Sweet Sesame Dressing that you can whip up in minutes and contains no weird ingredients. The next might be a bit off topic, so I’ll understand if it doesn’t fit the link-up. It’s called “Go Sweatshop Free!” and gives ideas on how to find earth-and-people-friendly threads for the family. I don’t have any affiliate relationship and I did not get any swag from companies described; I just know how it took my months to find the (growing) list and would love to share. Thanks so much for hosting. I’m having so much fun reading about other peoples adventures. It’s great to connect with like-minded people. Have a great week! I am number 148 today — Customer Service and Too Many Male Kiwi Plants. A lot of us run our own businesses, and while we can’t provide the prices of the mart stores, we can provide attention and care. That’s worth something, and if, as consumers, we recognize that, we’ll get more of it. Thanks for hosting Jill. A common problem in our day often need not be so. It hasn’t been all that common for very long because…. Your home sounds so lovely. 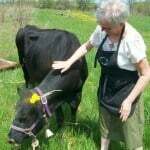 I have always wanted to live on a farm and if the right opportunity came along I would leave the city in a heartbeat. There is something so pure about the way of life away from the hustle and bustle of downtown. Congrats on finishing your chicken wire project. I wish you much luck in your upcoming reconstruction. Thank you!